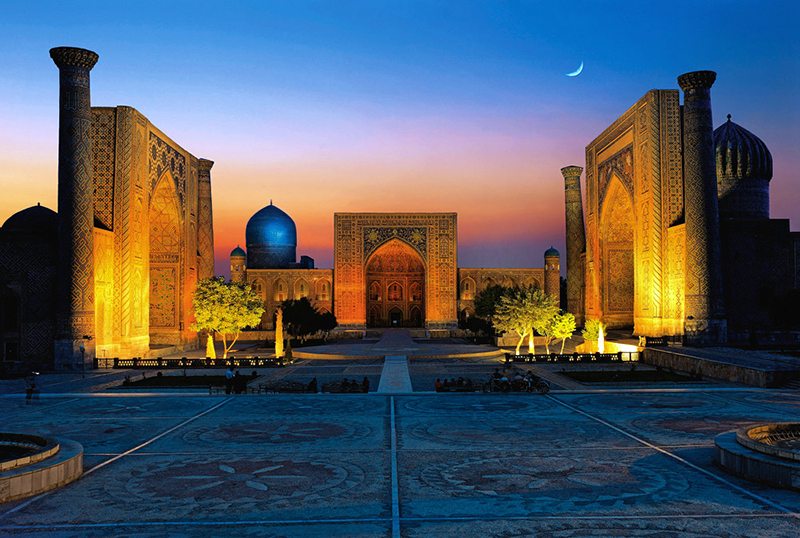 Without exaggeration, Uzbekistan is the most interesting country in Central Asia. Being the cradle of various civilizations for already two and a half thousand years, Uzbekistan can boast of a rich history and architecture wonders. Great rulers, among which such famous conquerors as Genghis Khan and Tamerlane, as well as wise enlighteners like Ulugbek and Bobur, blazed their trail on the territory that we now call Uzbekistan. If there were a Top most famous ancient cities of Central Asia, the first three places in it would be three cities in Uzbekistan: Samarkand, Bukhara and Khiva. These three cities literally represent this historical region, provoking in imagination wandering dervishes, caravans of traders, and architectural oases in the midst of sand in the desert. Definitely, these three cities cannot be missed, but in the eyes of an ordinary tourist they often overshadow other wealth of Uzbekistan, such as dazzling bazaars, ancient fortresses in the middle of the desert and an impressive array of natural attractions. The most important wealth of Uzbekistan is its optimistic, smiling and most hospitable people in the world! Uzbek people are always happy to talk and invite a foreign guest to their home. One of the main matter for foreigners is the matter of security. The people of Uzbekistan are known for their good nature and hospitality, therefore it is safe here both day and night. The study by the American Institute for the Study of Public Opinion "Gallup" was published recently, where Uzbekistan became the second in the world by the rating of citizens’ security in 2016. The World Tourism Organization (UNWTO) also conducted a sociological survey in 2015. It showed that 83% of tourists consider a trip to Uzbekistan safe, of which 76% recommend traveling to Uzbekistan to their friends. Since then the situation has only improved. The Government of Uzbekistan has recently initiated the Safe Tourism program, which will improve the tourist infrastructure of cities and technological equipment of attractions. Moreover, in order to help tourists, "Tourist Police" will be organized. National cuisine: pilaf, samsa, narin, shish kebabs and much more. Samarkand, Bukhara and Khiva: epic monuments of Islamic architecture in the middle of narrow streets of ancient cities, untouched by time and protected by UNESCO as a legacy of human culture. Art: high-quality and affordable performances at the Bolshoi Opera and Ballet Theater and the Ilkhom Theater in Tashkent, the Museum of Avant-garde Art in Nukus. Craftsmanship: a silk factory in Margilan, ceramics in Rishtan, knives in Chust, suzane in Samarkand, all this and much more in the markets in Bukhara and Tashkent. Yurts and camel safaris: Ayaz-Kala fortress in the desert, Lake Aidar. if you have only one day in Uzbekistan, you will easily have time to visit the most important sights of Tashkent, such as the Chosrou bazaar, Khast Imam complex, Amir Temur square and the Temurids museum, Independence square, metro, Minor mosque, Tashkent TV tower. Two-decker tourist bus runs regularly across Tashkent. Tickets can be purchased at the starting point of the route - at the Uzbekistan hotel. Moreover, tickets can be purchased from our website. To make it even more interesting, you can buy a one-day group or individual tour in Tashkent with a guide. Well, if you always dreamed of visiting a fairy-tale Samarkand, then it is possible even being in Tashkent for one day. Every morning a comfortable arrow-train "Afrosiab" departs from Tashkent to Samarkand. Two hours on the road, and at 10 am you are already in Samarkand. The same train leaves in the opposite direction in the evenings at 17:00 and at 18:00. Enough time to visit all the most interesting monuments of Samarkand. if you try to spend these three days maximally useful and saturated, then you need to start from Bukhara (from Tashkent, the morning flight or the Afrosiab train). After spending the whole day and night in Bukhara, in the morning you jump on the high-speed train to Samarkand (1.5 hours), where you will easily have time to see all the main sights. In the evening or early in the morning, the next day, take the train to Tashkent, where you spend the third day resting or getting acquainted with the sights of the capital. The same route can be traveled in the reverse order: Tashkent - Samarkand - Bukhara - Tashkent. In addition to trains, you can easily move between these cities by private taxi. They are, of course, slower than the Afrosiab train, but are roughly comparable in terms of a cost per person. If you do not like to hurry, you can choose only one city, except Tashkent, and get more acquainted with Samarkand (for example, go to neighboring Shakhrisabz) or Bukhara (and see the Summer Palace of the Emir, the City of the Dead and the Center of Sufism). Alternative variant: one-day excursion to Samarkand, a walk-through Tashkent, and on the last day - departure to Chimgan mountains, where you can relax on the beach and swim in the incredibly beautiful Charvak lake, go camping, paragliding or simply ride on cable cars. On our website, you can find a lot of tours for three days. in this case, one or two directions can be added to the options listed above. For example, a city museum in the open air - Khiva. One of the most ancient and well-preserved cities of Central Asia, with the largest number of ancient monuments. You can start the route from the flight to Urgench from Tashkent (there is also a train in this direction, but the road will take about 18 hours), and from Urgench take a half an hour road to Khiva by taxi or minibus. As for the route from Khiva to Bukhara, here again you can take advantage of an inexpensive flight, or use the services of private taxis, which will give you the opportunity to see a real desert with barkhans and camels on the way. If you consider that with Samarkand and Bukhara, ancient cities are enough for you, then Khiva can be replaced with a trip to the lake Aidar and to ancient settlements in the mountains of Nurata (yurt camps, camel riding). Or for a trip to the city of Termez in the south of Uzbekistan, where you can see the monuments of the Buddhist period. You can also visit such cities of the Fergana Valley as: Margilan (and personally see the process of making silk), Rishtan (the city of pottery and ceramics), Kokand (the capital of the ancient khanate with many preserved monuments). If you like really active journeys and trips rich with as much impressions as possible, include a visit to Karakalpakstan. In particular, the city of Nukus and the "Central Asian Tretyakov Gallery" - a museum of fine art, collection of which includes many works of the Russian avant-garde. The collection was assembled by the famous artist and art historian Igor Savitsky. Parts of the collection are regularly shown in the Pushkin Museum in Moscow and other museums around the world. Not far from Nukus is the city of Muynak, known for its "ship graveyard." The former port on the Aral Sea, due to an environmental disaster (associated with uncontrolled irrigation of fields in the Soviet era) is now remote from the remnants of the sea for 150 kilometers. In the port, ships still stand moored but now it’s in the sea of sand. In addition, more time can be spent in Tashkent. For example, visit several museums, go to an opera or a ballet at the Bolshoi Theater named after A. Navoi, relax with children in amusement parks, and in water parks in summer. In the end, you can allocate 1-2 days for shopping: go to the Chorsu bazaar, take a walk-through shopping centers and craft shops and buy souvenirs for yourself and for loved ones.